By Zacharias Antony Njavallil, DQ Week Madras, 24th February 1997. Ensconced in his room, with a multimedia machine, an Internet connection and a well stacked library sporting a spectrum right from 'The Last Don, Mario Puzo' to 'Made in Japan, Akio Morito', all that he would miss is the outside world. Well, if you can't run to the outside world, what is the next best option? Bring the world to you -- of course. Well, that's exactly Alexis Leon thinks too. In his late twenties, paralyzed from chest down, this software engineer is, with a combination of his machines, technology and abilities, more than a passive spectator. Coming from a Syrian Catholic family, residing near Kottayam in Kerala, Leon had always been outstanding in his studies and perfectly fit too. Among other distinctions were the First Rank in the B.Tech Industrial Engineering and similar recognition for the M.Tech course, both completed at the College of Engineering, Trivandrum. 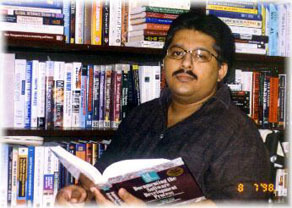 His first job was at Pond's (India) Ltd.-a Hindustan Lever Ltd. group company - as an Industrial Engineer. The next stop was Tata Consultancy Services (TCS) as a Senior Systems Analyst. Involved in the prestigious 'SECOM-NEW' project for SEGA/Intersettle, Switzerland, a computerized securities clearing system, he was all set to go to Switzerland in the first week of January 1994. But, on December 2nd 1993, while coming back from work, an auto rammed into his bike, resulting in Spinal Cord Injury. For around 3 months, Leon underwent treatment at Vellore, and was discharged, immobile chest down. Moving around in a wheelchair, Leon joined TCS again, but soon with his old friends flying off for greener pastures, he felt out of place. 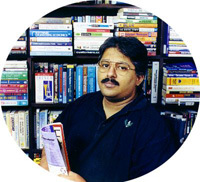 In 1995, Leon left TCS and partnered a new firm, Cybernet Software Systems Pvt. Ltd. However, after a year as Technical Director, he had had enough. Reading was a habit, which grew with Alexis. "It was books that helped me cope up with limited mobility", he declares. A voracious reader, in the confines of his room, he was left with ample time to pursue his hobby. More than 25 magazines covering the range from general to most specialized pass through his hands every month. And the book collection grew too. However, with the cranium bulging and energies pent up, came up the desire to write. The first two books -- 'DB2' and 'CICS' -- were on the Mainframes, written for professionals planning for an overseas career. 'How To Become A Successful Software Professional', 'Oracle 7 - The Application Development Handbook' and 'Oracle 7 Desk Reference' were the next in line. "Hitherto, the books on these areas were from abroad and terribly costly. Well, you could say that I cut the price barrier providing the texts for Rs. 150 -- then available ones cost something in the range of Rs. 800 - 1500". But that is not all. With his expertise covering everything from PCs to Mainframes, Leon has also been appointed by foreign firms to recruit their software professionals. And right now, at least two telephonic interviews, with an average time duration of one hour each, is a part of his daily schedule. And this is where Leon tries to do his part in the philanthropy. "I have come to realize that there is a lot of goodness in people, and on my part, I try to do my share", he says. Candidates who are not selected due to some shortcomings are told about their weak spots and ways to overcome them. And, he also helps professionals prepare their resumes, real professionally, without any payment, of course. As for his future goals, "Being independent is the number one goal. The longer term one stretches up to winning the Nobel Prize". Two books, 'Zen of PowerBuilder', 'PowerBuilder 4 - The Application Developer's Handbook', ca-authored with Richard Brooks, a top US software consultant are already under print. Five or six books on IT are already on his mind, then would come an autobiography. The title for the piece de resistance is already fixed -- Reinventing the Wheel --more on Alexis there.